Not to worry. It's sounds like a typical pop-up scam. You're probably ok but you could run an antivirus scan just in case. 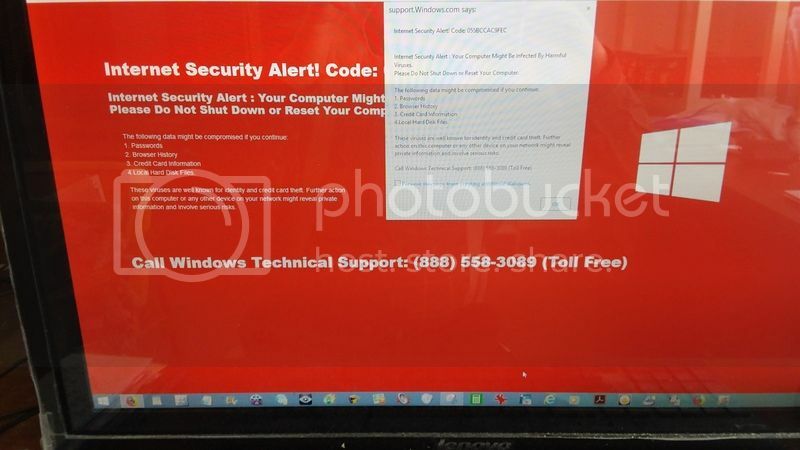 One of the respondents says that phone number is not Microsoft Tech Support, regardless of the screen message says. As jserraglio says, it's a scam What the perp has to gain from it, I can't guess. Still, it got into your computer somehow. Either a web site you visited, or an email you opened, or something you downloaded, or whatever. If you can remember anything like that which was unusual, i.e. you hadn't done it before, why not let us know? For information and maybe for safety's sake. The Perp records you, if he can get you to say yes., no and i guess some of the last four of your social, he edits it together and if extremely lucky, gains access. My experience and that of my significant other, aka my wife, is that these pop-ups came via sites, not emails. So you may be able to check yr browser history for that one site you haven't visited before. That's what I did and then shunned the culprit site. I looked up the 888 phone number and found this...Still, it got into your computer somehow. Either a web site you visited, or an email you opened, or something you downloaded, or whatever. If you can remember anything like that which was unusual, i.e. you hadn't done it before, why not let us know? For information and maybe for safety's sake. So you may be able to check yr browser history for that one site you haven't visited before. That's what I did and then shunned the culprit site. When something computer-bad happens, everybody I know (especially ME) sez, "I was being very careful." I wish I had a dollar for every time I told that to the IT guy at work who just grinned back at me. Look in History and see if you can find the new site you were on when u got the pop-up. They are all time-and-date stamped in the browser history database. Don't bother with sites you visit regularly or sites u know are reliable. If you can identify a site that might have served you up the pop-up, don't go there again. If not, it's not a big deal (see below on how to shut down a freeze). In my experience, the site itself may be innocuous--it may be a third-party ad service that rewards the site owner for clicks that's serving up those nasty pop-ups unbeknowst to the owner. And if you are not already using Chrome use it. It's reasonably secure and will block a lot of this shite. Definitely install an ad-blocker extension within Chrome. I did that for my wife and it stopped the pop-up freezes in their tracks. I use Ad Block and Ghostery. What happened to you does not sound like pre-ransomware. But I understand yr anxiety b/c I have experienced it several times myself. And my wife literally freaked out when they froze her computer the same way they did yours. She was gonna call the number if I hadn't stopped her. The crooks bank on just this kinda fear to score an easy mark. By then I was savvy, so what did I do? I just held down the ctrl + alt + delete keys, clicked Start Task Manager, found the name of the web browser listed under Applications, highlighted it, and clicked on End Task. Then I restarted her browser and all was well. That's in Windows 7: the sequence may be a bit different in Win 8-10. Now if I did ever get hit with real ransomware, "What, me worry?" I would give the f'ckin' bastards a metaphorical double-bird salute, wipe (or have a tech guy) wipe my hard drive and reinstall Windows plus the very few cheap apps I regularly use. I would lose nothing b/c all my local data is backed up regularly either to the Cloud, or a DVD-R or CD-R, or an external storage drive, so I pay nobody to get it back. Good rule of thumb. if you absolutely cannot afford to lose the data, back it up 3 times in 3 different ways, one of which is off-site. Otherwise, you are playing Russian Roulette. I once had to use my 3rd off-site back-up in an emergency. If I hadn't made it, I would have been in a world of professional hurt. Hackers have ways of infecting an innocent Web site with malware. Since others have had the same problem, it has to be a site of some general interest, i.e. not Classical Music Guide. And I expect it's the most recent site you browsed before the incident, or one of them. Checking your browser's history may not be as big a job as you think. Right, and a secure browser like Chrome should help prevent a recurrence. It did for me and my dearly beloved. If you don't wanna bother with yr browser history, you can just wait till it happens again and then you will know exactly which site to avoid. Checking your browser's history may not be as big a job as you think. The best at the moment appears to be Bitdefender though Norton ranked very highly as well.